Tessalone, a USC senior associate athletic director since 2012, became the school’s SID in 1984 and owns the longest tenure of any SID in the school’s history. He has worked 25 Trojan football bowl games, including 11 Rose Bowls. Overall, he was worked more than 400 USC football games, including a streak of 243 consecutive from 1980 until missing 2000 Notre Dame contest because of broken ribs. His current steak stands at 168 games since the injury. Under Tessalone, the USC Sports Information office has received the “Super 11 Award” in 2009, 2010 and 2011 from the FWAA for “excellent media relations” (one of just two schools to be honored in each of award’s first three years). 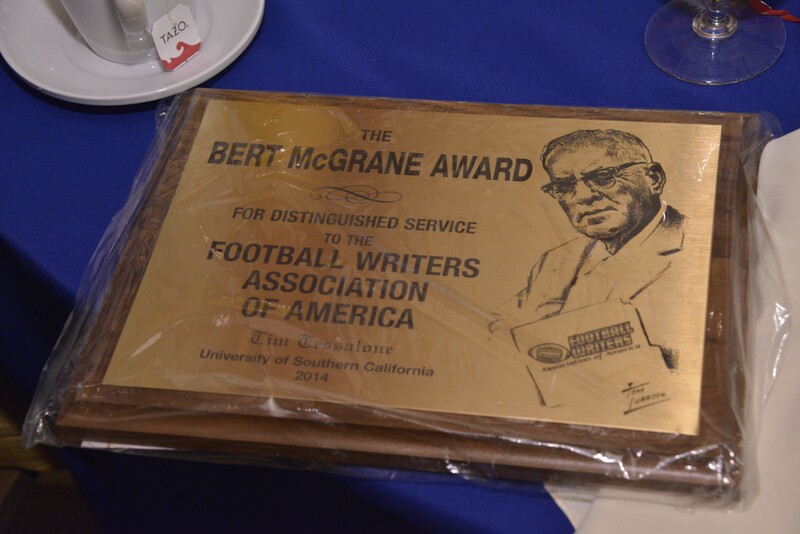 “I can’t think of anyone more deserving of this year’s Bert McGrane Award,” said 2013 FWAA President Chris Dufresne. “Tim Tessalone defines, to me, what a great sports information director should be. He has deftly navigated his obligation and loyalty to his school/employer with the highest quality of professionalism in dealing with journalists trying to do their jobs. It is often a near-impossible tightrope act. Tessalone graduated in 1977 with a bachelor’s degree in public relations from USC. He and his wife, Trudi (USC ’80), have three children, sons Troy (USC ‘08) and Trevor (USC ’10), and daughter, Tori (USC ’13). “I am unsure why I am being recognized for doing what is, simply, my job,” Tessalone said. “ SIDs are people who should be in the background. It is not about us, it is about the coaches, student-athletes and staff we promote and the media we service. I am blessed to have worked beside many talented men and women over the years in the USC Sports Information Office whose goal was the same as mine: providing the best service possible to USC and to the media. 1991 Murray Olderman Newspaper Enterprise Assoc.